Spring break has been rocking in our backyard. The music has been gloriously loud, so much chatter that I don’t mind being an observer instead of a participant. Just listen to the audio file above while you read. Robins dominate the crowd in number, but cardinals and other small songbirds chime in above the hubbub. The robins swoop from one tree to another while others hop and peck in the grass, lift off and settle back down to peck more. One robust fellow hogs the birdbath. 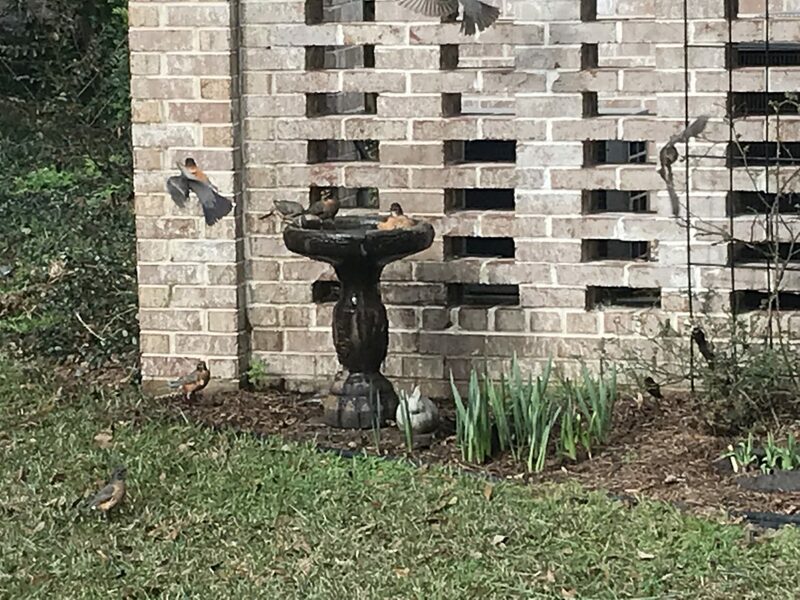 Yesterday, no bird could budge him, but today they discovered that he’s more feather than beak, and now three birds crowd their concrete hot-tub. Despite the buoyancy brought by our spring breakers, I resist spring’s return, a strange reaction to my used-to-be favorite season, the season that brings my birthday. I want to deny her approach, because winter skipped out, and I had hoped she’d finally bluster in for a couple of weeks. If I dig deeper, though, I realize that I turn my head away from every season’s appearance. The change in light and temperature remind me of past seasons, and I don’t want to advance through the year and leave memories and the people in them farther and farther behind. I’m a melancholic and think too much. For Lent, I decided to lasso negative thoughts and whip them into positive ones. One way of doing this is to consider the invading negative idea and find aspects for which I can give thanks. I choose to party with the robins, while giving thanks for birthday parties in the past. I push regrets into God’s lap and determine to open my eyes to the gifts of the present. Instead of disregarding precious moments in sadness, thankfulness stills me with contentment. I’m not running away from or longing for the past or future, but living in God’s present presence. I don’t have control over past or future, and not much in the present, but I can choose to notice the blessings around me, to relish the excitement of migrating birds, sniff the newest rosebud and wonder at the color perking up the world again. I know I please the Lord when I do this. It is a choice He has empowered me to make. And when the cloud of depression descends, my longing for victory in my Lenten intention drives me to pray. I confide my feelings to the One who knows and understands me so well. I confess my weakness and ask for His help, and so, so often, His goodness shines through the haze. I go outside and see it in His Presence in the present, or if it’s still foggy, I close my eyes and listen to the signs of life and give thanks that as long as there’s life, there’s hope.